Let’s talk about detergent bottles. Wonderful, adaptable detergent bottles. Most people have one use for them — to hold laundry detergent. But if you look at the design of modern detergent bottles, they clearly have a life beyond the last drop of liquid goodness inside. All it takes is a little imagination. In my previous post on reusing disposable items, I briefly touched on the detergent bottle. And in doing so, I uncovered a multitude of uses for this versatile bottle that is usually trashed or recycled the second it runs dry. According to Diabetes.org, over 8% of the US population is diabetic (PDF). That’s quite the statistic. A vast majority of those people require regular shots of insulin, and those needles, or sharps, must be disposed of safely. They sell sharps containers in the stores, and they run anywhere from a few bucks to several hundred dollars for a two-gallon size. But why bother spending any money? Take an empty detergent bottle, secure the lid to the base with strong tape, and cut a small slot in the top. You now have a safe place to keep your sharps. When it’s full, seal the slot and dispose of it safely (PDF). Either way works; it just depends how much ice you have and how much you want to put down on the floor. Clean your detergent bottle and fill to the top with water. Place it in the top of your plant pot, or next to plants in the garden, and punch a few very small holes in the bottom (plus one in the top if you want the water to flow more freely). You now have a simple but effective tool for providing plants with a slow and steady source of water. This is very helpful if you’re going on vacation and don’t want your plants to perish in your absence. It’s also good if you simply want to remove a daily task from your agenda. Now, watering the plants can be done automatically; all you need to do is fill up the container when it’s empty. Seriously. There are plenty of pictures of detergent-bottle lamps demonstrating the various methods available to you for construction. Some simply require you to thoroughly wash your bottle, which includes removing the label, and then attaching to a lamp fitting. Others are much more elaborate. The lamps are unique, and if done right can look like art with a high dollar value. I saw this one at a friend’s house, and he sent me the link to the original toddler tool box creator. If you have one of those huge detergent bottles and also have young kids, don’t throw it away. Follow these instructions to create a fun (and free) toolbox that your young one can carry all of his or her valuables, cars, dolls, or anything else in. And the grown-ups can use it too. Hot on the heels of the ice melt shaker, you can also use your old detergent bottles as watering cans. The small ones are great for the younger kids, and the big ones work almost as well as the pricey ones from the hardware stores. Just wash your bottle thoroughly, then poke many small holes (a metal skewer is good for this) in the lid. Fill with water, tighten the lid, and you have a great watering can for nothing. Don’t pay for a scoop again. Just cut your clean detergent bottle diagonally across the middle, and you have a sturdy scoop that can be used for all sorts of things. Make one for the cat litter, one for fertilizer, and even use one of the larger ones as a dustpan. You can also use a straight cut across the middle to create a funnel, which can be handy for pouring paint into smaller containers. Literally. The first set of weights I ever bought were light as a feather. When you took them home, you would fill them with sand and they became heavy enough to use in a workout. The same principle applies here. Fill your different sized detergent bottles with sand and you will have weights of varying sizes, which can be used like a kettle bell for strength training. Paint cans are annoying. They have to be hammered shut, opened with a special tool or screwdriver, and the paint always drips down them. If you don’t get the lid on tight enough, you will be greeted with a can of thick or dried out paint when you next use it. Even a small amount of water loss from the can change the color and consistency. So, when you’ve got paint left in a can from a decorating job, pour it into a detergent bottle and screw the lid on tight. When you next come to decorate, you’ll have fresh, easily pourable paint with no drips. Make sure you put a little of the paint on the outside of the bottle to recognize it on the shelf. A few people in my neighborhood have basketball hoops, and they weight them down with sandbags. You can create your own weights with sand and a detergent bottle, just like in the free weights tip. These can be used to hold anything down, such as tarps, tents, or sports nets, or used to add additional weight in your trunk in those tough winter driving months. Worms are a gardener’s best friends. Slugs, alas, are not. They are a pest that can destroy your plants and vegetables. To make a simple slug trap with a detergent bottle, make a straight cut 2-3 inches from the bottom. Sink this base into the ground, ensuring the rim is level with the soil, and fill with bait (a little beer, or some water and yeast). You can also coat the inside walls of the base with a little liquid soap. The slugs will come in to feed, but cannot get back out. This is about as easy at it gets. 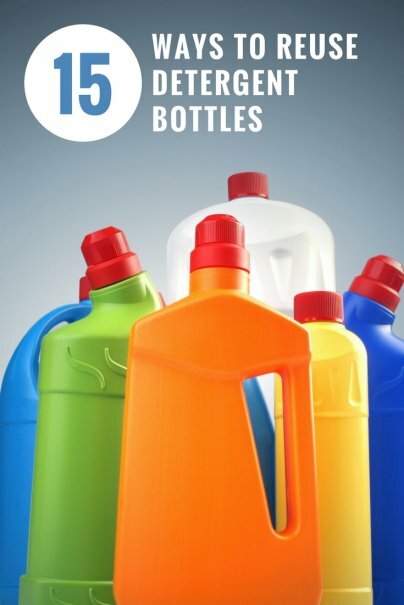 Clean the detergent bottles thoroughly, removing the labels. Then screw on the tops very tight. You now have cheap and effective floats to help the little ones in the pool. My grandpa, a keen gardener, used to do this with old plastic milk jugs; but it works just as well with detergent bottles. Clean them, fill with water, and leave them on your potting table or in your shed. Place some napkins and liquid soap nearby. When you’re ready to come in, you’ve got the convenience of a sink without the plumbing. Tuppence a bag! Sorry, I love Mary Poppins. I also love birds, and I have a feeding station on the front lawn. You can create a good bird feeder from detergent bottles, and a little green or black spray paint can make them blend right in. First, cut holes in the sides of the jug, around 2-4 inches in diameter. If you want to provide perches, drill holes and push dowel rods through them. Puncture a few small holes in the base for water drainage. Then, hang from a tree or garden pole and fill with seed. A penny saved is a penny earned. So don’t buy a piggy bank, use an old detergent bottle and use the money you saved as your first deposit. Simply clean out your bottle, screw the top on tight, and cut a slot just big enough for the largest coin to fit through. Have the kids paint it if you want, or spray-paint it yourself. You can duct tape the lid onto the bottle to deter people from dipping into the fund. And if you want it to be really tough to open, apply some super glue around the spout and screw on the lid. The only way you can get it open now is to cut it open. When you do, if it’s full, you’ll have quite the spending spree to go on. I use mine to store kitty litter. The spout works great, no more spills! Some great ideas there. Here in the UK we usually put our plastic in recycle bins that get taken away every two weeks. You've got your own form of recycling, well done. Very creative ideas! I really like the watering can, paint storage, and free weight ideas. A great way to be friendly to the environment and be frugal at the same time. YOU CAN ALSO TIE A LENGTH OF FISHING LINE A HOOK, SOME BAIT AND A SINKER AND USE THEM FOR FISHING JUGS. Great post. I like the one about watering can or I should say waterring bottle and the kettlebell one. Very creative! We now make our own laundry detergent and just the same container over and over again. It saves on so many going to be recycled and it saves us more than a few dollars each month. with the orange ones, we use as pumpkins. Cut the top off, paint the face on the side with a black sharpie, drop a votive candle or small flashlight inside. To rinse the container clean, use the water that's filling your washer - if you have a top loader, you think that thing is empty and you can still get at least another small load cleaned... and for not winding up with the caps on the the spouted containers getting gummed and gross you can just throw it in the with the wash load instead of emptying it - and then what are you supposed to do with it? I have dozens of blue plastic Maxwell House coffee containers. I have used some as planters and some to store misc. shop items like nuts, bolts and small tools. Most of them are currently sitting empty in the attic. I was disappointed when they changed to a smaller container design recently. The slug trap is an interesting idea. I had used little containers of beer and was catching slugs until a raccoon started drinking all my beer. Hopefully they do not like the taste of Tide. When school is out for the summer, I have all 5 grandkids during the day while their parents work. We go through a lot of bubbles. I use the huge container with the spigot and fill it with bubble liquid. It is easy enough for even the youngest to refill her own bubble jar. I don't have to get up each time 5 kids need more bubbles!